"Even if they come with a glowing review from your sister-in-law, you still need to check the credentials of every professional on your short list,” said Dan DiClerico, Consumer Reports home and appliance content specialist. Homeowners have to be vigilant in selecting the right team for that next renovation project, as the demand for remodeling work could outpace the supply of quality professionals, says Consumer Reports in its recent Home Remodeler’s Survival Guide. The construction industry is in the throes of a massive labor shortage, having shed more than 2 million jobs since 2007. A recent survey of 300 general contractors from around the country conducted by the Consumer Reports National Research Center suggests there are still less experienced—and less scrupulous—contractors out there. Among the potential shady industry practices that general contractors reported to CR about their peers were winning jobs with lowball bids and then jacking up the cost later with “unforeseen problems” (35%), using unskilled or inexperienced laborers (31%) to carry out their work, and taking on more jobs than they could handle at once. In addition, 24 percent of contractors reported that other pros overcharge for materials. While 69 percent of the contractors in CR’s survey reported they are licensed, registered and insured, 31 percent said they were not; almost a fifth of general contractors lacked either a state license or the proper insurance, and 9 percent lacked both. Though proper credentials aren’t a guarantee of quality, they’re a good sign that the general contractor runs a reputable business. What’s more, CR’s survey found that fully accredited general contractors are better at holding down costs when unexpected problems arise. For more information on Consumer Reports’ Home Remodeler's Survival Guide, including reviews of home-services directory websites such as Angieslist.com, Checkbook.org, Homeadvisor.com, Houzz.com, and Porch.com, visit ConsumerReports.org starting May 2, or pick up a copy of the June issue of Consumer Reports. Consumer Reports’ survey also found homeowners should always negotiate the costs of a renovation project. There may be more wiggle room in an estimate than most people think. Only 4 percent of the general contractors in CR’s survey said they are never willing to negotiate the price of a job (66 percent are somewhat willing, and 30 percent are very willing). According to CR’s survey, the median profit margin that contractors build into their estimates was 25 percent. Keeping the business of a repeat customer was the biggest reason to haggle, cited by 75 percent of general contractors, who reported offering a median discount of 10 percent. So if there’s more work coming down the line, be sure to mention that during negotiations. Combining projects could also save in the long run: Two-thirds of general contractors said they offer discounts on jobs involving more than one room. Even with the best plans in place, Consumer Reports’ survey suggests homeowners should be prepared for surprises. When CR asked general contractors about job-related problems that lead to delays or cost overruns, they said that many of the culprits are hidden behind walls—structural damage. Among the contractors in CR’s survey that experienced such problems, the most common that lead to costly overruns were existing structural damage (42%), materials arriving broken or different from what was ordered (31 %) and getting permits (30%). More information on the survey, tips on selecting the right team for the next renovation project, and CR’s guide to renovation without aggravation can be found on ConsumerReports.org starting May 2 or in the June Issue of Consumer Reports. Consumer Reports is the world’s largest and most trusted nonprofit, consumer organization working to improve the lives of consumers by driving marketplace change. Founded in 1936 Consumer Reports has achieved substantial gains for consumers on health reform, food and product safety, financial reform, and other issues. The organization has advanced important policies to cut hospital-acquired infections, prohibit predatory lending practices and combat dangerous toxins in food. Consumer Reports tests and rates thousands of products and services in its 50 plus labs, state-of-the-art auto test center and consumer research center. Consumers Union, a division of Consumer Reports, works for pro-consumer laws and regulations in Washington, D.C., the states, and in the marketplace. 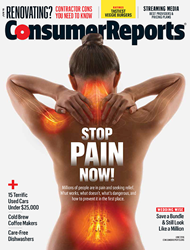 With more than eight million subscribers to its flagship magazine, website and other publications, Consumer Reports accepts no advertising, payment or other support from the companies whose products it evaluates.